The dust-heaps in Somers Town as seen in 1836. Image is from an engraved wood print, circa 1880. The world is a surprisingly small place. This article, used with permission from the Thames Sailing Barge Yearbook 2004, proves the point. In it we learn about the relationship between Charles Dickens, his novel – Our Mutual Friend, the “Golden Dustman” of London and sailing barge races on the Thames. 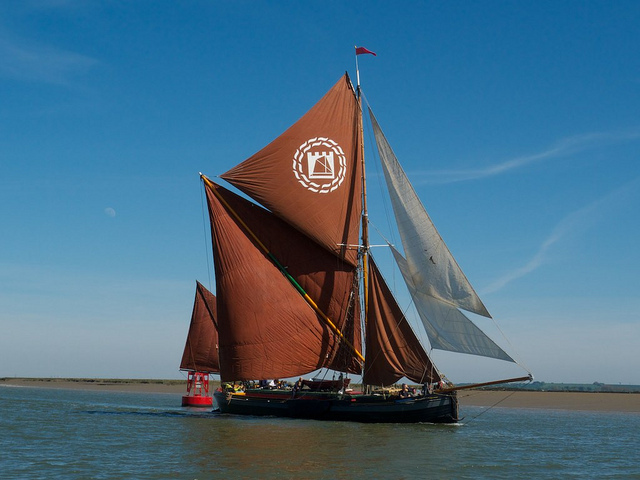 The match of historic Thames Sailing Barges is an annual event. The first match took place in 1863. The race starts in Lower Hope Reach, about four miles down river from Gravesend, and the finish line us usually near Saint Andrews Gardens. Henry Dodd was born in 1801 and started his working life as a ploughboy in the fields within sight of St. Paul’s Cathedral, London. His was a “rags to riches” story with his riches coming from rags. By 1836 he had become a “scavenger” (refuse collector) and rubbish carter. He developed this into a highly successful business and then diversified into brick making. He was, for a period, a member of the Metropolitan Board Of Works during which time he was involved in the Board’s consideration of various plans, including the Thames Embankment and York Gate landing steps. Interestingly, he as also a Freeman of the Butchers’ Company, which did not reflect any of his publicly known business activities. These however brought him great wealth and by the time of his death in 1881, aged 80, he was work over £100,000, a remarkable figure at that time, which in current day values is over £5,000,000. Not surprisingly, he was known as London’s “Golden Dustman” during his lifetime. 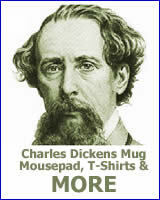 Charles Dickens is associated with the Thames Match in various ways, although this escapes mention in the standard works of Dickensian literary analysis and criticism. The principal strand is directly through him knowing Henry Dodd, the “Golden Dustman”. 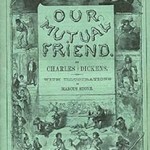 Dodd is considered to be the inspiration for Dickens’s character of Mr. Boffin, the wealthy London dustman in the novel Our Mutual Friend. This particular association came about as a result of a passion that Dodd and Dickens shared – that of the London theatre scene. Dodd offered the Royal General Theatrical Fund, at the English Opera House, in London, a gift of 5 acres of land in 1858. Dickens was one of the trustees and its first chairman at the time. Interestingly, although he publicly accepted the gift he later rejected it in 1858 as he believed the stipulations that Dodd imposed on its use were unacceptable. Another connection between Dickens and the Thames Match is that several locations featured in Dickens’ novels can be seen if you are afloat on the Thames following the Match route. Others, if you are on foot, watching the barges from the coastal paths during a Match, or taking a coastal walk at some other time of the year. The original 18th century name was The Ship and it is thought to have inspired the waterfront tavern, The Ship, where Pip hides Magwitch, the escaped convict, for the night to await a ship to the continent. Pip, with accomplices, is rowing Magwitch from London down river in expectation of waylaying a regular steamer, whilst under way, in the Lower Hope, off Gravesend, bound for Hamburg. Dickens this time specifically refers to a “battery” rather than a “fort”. The former, would in his day, as it is now, be little more than a grassy mound. Dickens has Magwitch the convict escape from a prison hulk anchored in the Thames, off the marshes beyond a church. This is generally considered to be the St. James’s Church, Cooling, implying the hulk was on the Blythe Sands. 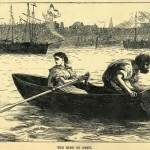 Pip plans the escape by sea of the convict Magwitch in an area of the Thames well clear of Gravesend because it was a ” . . . critical place for search or inquiry if suspicion were afoot”. Allhallows-on-sea, within walking distance of the Nore fits the clues but no pub exists on the shore today – only The British Pilot, approximately 0.6 nm. inland. Dickens’s character is located somewhere between the Thames and the Chatham Dockyard and is describing the spritsail Stump rigged sailing barges used for transporting hay up-river to London’s horse population. They were known as “Stackies” (as in “hay stacks”). 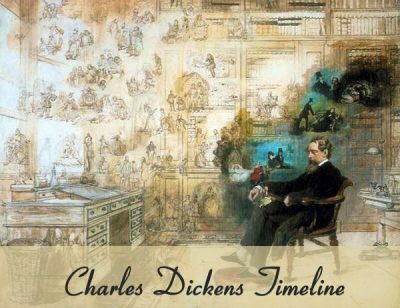 Riddle me this, what's the last novel that Dickens ever completed? 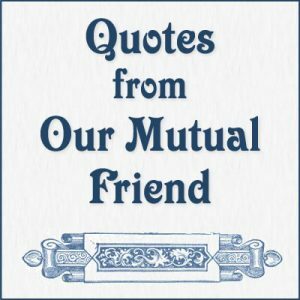 If you answered Our Mutual Friend, you're correct. You also may have the answers to the crossword puzzle based on Our Mutual Friend.